While overt prejudice is now much less prevalent than in decades past, subtle prejudice - prejudice that is inconspicuous, indirect, and often unconscious - continues to pervade our society. Laws do not protect against subtle prejudice and, because of its covert nature, it is difficult to observe and frequently goes undetected by both perpetrator and victim. 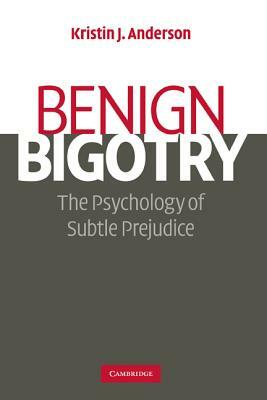 Benign Bigotry uses a fresh, original format to examine subtle prejudice by addressing six commonly held cultural myths based on assumptions that appear harmless but actually foster discrimination: 'those people all look alike'; 'they must be guilty of something'; 'feminists are man-haters'; 'gays flaunt their sexuality'; 'I'm not a racist, I'm color-blind' and 'affirmative action is reverse racism'. Kristin J. Anderson skillfully relates each of these myths to real world events, emphasizes how errors in individual thinking can affect society at large, and suggests strategies for reducing prejudice in daily life.